It seems fitting to have, on this Thanksgiving Day, a brief film about food. Only it isn't turkey. No, it's wabbit season in Florida, or at least in this review of The Rabbit Hunt, another documentary short. The Rabbit Hunt is an interesting slice-of-life of a tradition that I had never known. It would have been better if director/producer Patrick Bresnan had put a little more context in the film itself, but what we have is well-crafted, if more opaque than needed. 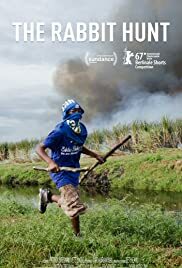 We follow an African-American family who go down to a sugarcane field being harvested. The various members work around the edge of the reapers, which have an unintended benefit: drawing rabbits out from the fields into the open. The various members, though it is mostly young men and boys who do the hunting, start chasing after the rabbits, using sticks to either chase them or beat them for capture. It's fast work for obvious reasons, and at the end of the hunt, they manage to capture sixteen bunnies. Off home they go, where they skin them, wash them, sell a few to a police or sheriff officer who is apparently a friend, and cook them where we end The Rabbit Hunt with an unseen member munching on one. I have to admit, the cooked rabbit does look good. There is more press information that The Rabbit Hunt alone does not tell us, information that puts things in greater context and provides a background. For example, we are told that the location is the Florida Everglades, specifically near Lake Okeechobee. We're told that the main hunter is seventeen-year-old Chris, and that this is a tradition that dates back to the 1900s. We're also told that this hunt is a 'rite of passage' for the young men. All that came from the press information to The Rabbit Hunt. None of that information came from the film itself. As such, even with the brief running time of 12-13 minutes, someone going into The Rabbit Hunt would not have any of this background to which to follow the film. Instead, he or she would see a family going out into the sugarcane fields and chase rabbits to death. For those who find the actual killing of animals distressing, The Rabbit Hunt might prove upsetting. In a case of mixing metaphors, it does not hide how the sausage is made. We see them beat the rabbits in the head and the body. We see them gut the animals before heading home. We see them hang the rabbits to dry on a clothesline and see them skinned. We see them cooked and prepared. As a side note, one wonders about about any diseases the rabbits may have, though the cooking process looks very thorough. This family is very familiar with how to prepare rabbit meat...wonder about rabbit stew. Any vegetarian/vegan might be horrified at this, but The Rabbit Hunt is not gratuitous. This is how rabbits are hunted, and those who hunt the rabbits do hunt them for food, not sport. It is hunting in the purest sense: for necessity versus pleasure. As someone who loves lamp chops, I can't place myself on a high horse about how this family eats rabbits. This is reality, and those who should know where meat comes from should not be repulsed when shown when it is shown at its most basic level. Given that this family sells rabbit meat, and that others partake of it, I figure this is a local delicacy in the Florida Everglades. Everything else surrounding The Rabbit Hunt itself is a bit of a mystery, and I think this is where Bresnan could have maybe put in some title cards putting things in context. Whether he thought background information was necessary or not I cannot say. The Rabbit Hunt is an interesting short film on the ingenuity of people and on how something as simple as a rabbit hunt can be almost a bonding experience, and one that provides food and finance. It leaves some questions but on the whole it works well as a look into a world most know nothing about.